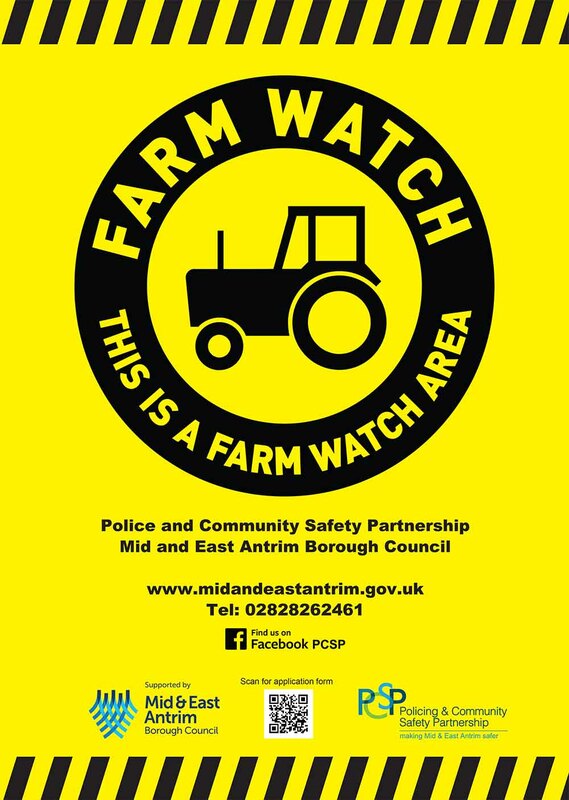 Farm Watch has been developed and is delivered by Mid and East Antrim Borough Council's Policing and Community Safety Partnership (PCSP) in conjunction with the PSNI. Farm Watch aims to address concerns raised by the rural communities across the Borough providing them with an opportunity and support to help reduce the risk of the most vulnerable becoming a victim of Rural Crime. Farm Watch has been developed to support those living or working across all of the Borough's rural communities. As a member you will receive up to the minute text alerts from the PCSP and PSNI on issues which may affect your community. Please indicate the area of Town or Village you live or work? I hereby give Mid and East Antrim Borough Council / PCSP authority to place my details on a computerised database system. In accordance with the Data Protection Act 1998 we have a duty to protect the information which we hold about you. The information provided will be used for the Farm Watch Text Alert Scheme only and will not be shared with any other organisation without prior permission.